The Bible version used here is the American King James. If you prefer to use a more modern version (NASV), please click here. All the biblical passages have been classified by topic, following the chronology of events reported by the Bible: from the Creation of the Universe to the Inauguration of the New Earth. 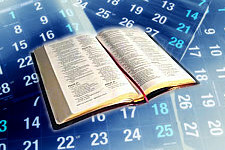 In order to standardize the allotted time, each daily reading contains a similar number of verses, while staying in harmony with the natural breaks in the biblical narrative. Start this stimulating and innovative Bible reading plan today! To try it is to adopt it! See you tomorrow!